Kimberly Zimmer visits neurologist Rohit Dhall, M.D., to check the results of her deep brain stimulation surgery. Aug. 13, 2018 | Aug. 13, 2018 | Kimberly Zimmer stretches her arms out in front of her and smiles. The 50-year-old is showing off how steady her hands are. “Never in my life have I been able to hold my hands that still,” she said. Zimmer had been diagnosed with essential tremor as a child. Fellow students bullied and poked fun at her for shaking. As she grew older, the condition progressed to the point that she was unable to hold a drink without spilling it. Eating was a challenge, too. Zimmer says she couldn’t keep food on a spoon long enough to reach her mouth. 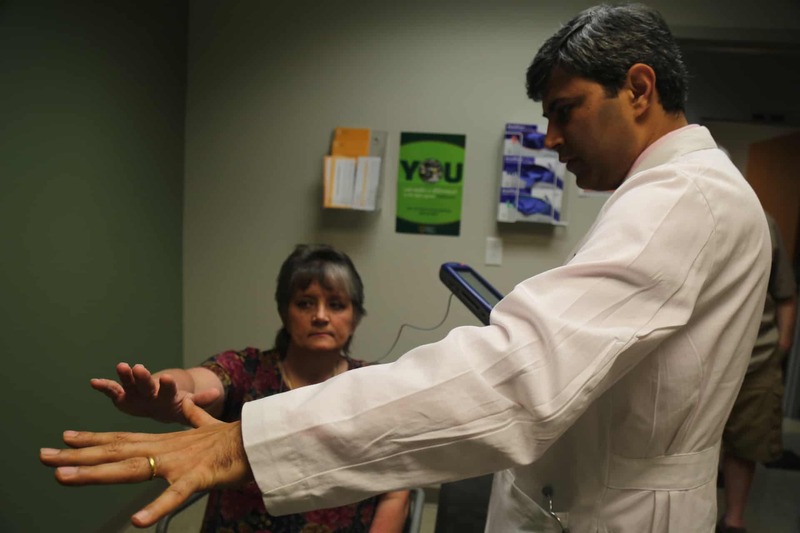 UAMS neurologist, Rohit Dhall, M.D. explains image to his patient, Kimberly Zimmer. Zimmer had tried all medications available on the market to help reduce her tremor. None of them seemed to make much difference. Her neurologist referred her to UAMS’ Rohit Dhall, M.D. to see if she was a candidate for a surgery called deep brain stimulation. Dhall is an associate professor of neurology in the UAMS College of Medicine and director of neurodegenerative disorders at UAMS. Essential tremor is eight times more frequent than Parkinson’s disease. Dhall says most eligible candidates are unaware this treatment could be available to them. Only 3 percent of those who qualify get the surgery. But for most who do, the odds of improving are greater than 90 percent. UAMS neurosurgeon Erika Peterson, M.D., performed Zimmer’s surgery the day after Thanksgiving 2017. During the operation, Peterson placed small electrodes into the areas of the brain that control movement. Patients are awake during the surgery because doctors say it’s the best way to reliably test if they’ve hit their intended target and to insure there won’t be side effects from the electrodes as the patient comes out of surgery. Once the electrodes were placed, Dr. Peterson had Zimmer draw the same shapes and sign her name. No longer hesitant to eat in front of people, Zimmer enjoyed Christmas dinner with family. Zimmer says the absence of the tremor has been life changing for her. Zimmer returns to the clinic once every 6-8 weeks for necessary adjustments. Since opening the UAMS Tremor Clinic nearly two years ago, Dhall said, hundreds of patients have been treated.